The High Performance supercar-inspired HP4 Lighter was engineered to deliver optimum performance and output. The dominant appearance of the HP4 embodies a newly designed chassis. 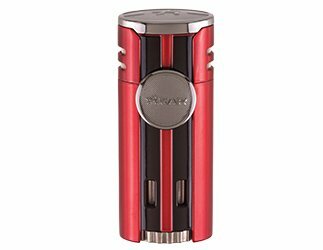 An in-line fuel adjustment wheel, oversized double EZ-ViewTM red fuel windows and four angled jets create an apex of precision engineered flames to concentrate heat and efficiently light any cigar with confidence. The manual flip-top lid not only protects the quad jets, but also retracts more than 90 degrees ensuring plenty of room to light small or large ring gauge cigars.